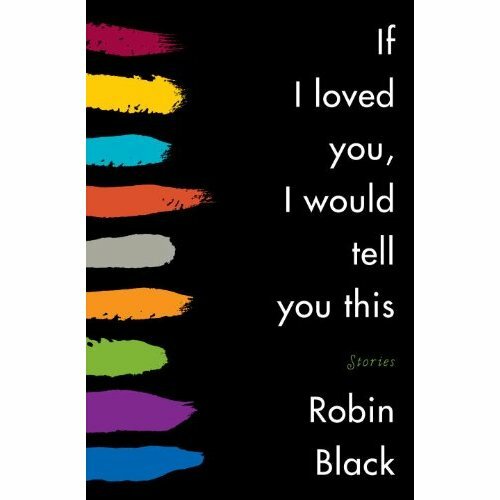 If I Loved you, I Would Tell You This is an exquisitely crafted, eclectic collection of short stories by Robin Black. Diverse characters and Black’s unique style and an eye for the darker side of humanity spring forth from the page. Recently, I spoke with Robin about her writing process and her debut collection of short stories. Amy Steele [AS]: What do you like about writing short stories? Robin Black [RB]: In a way I think that there are parts of short-story writing that tap your brain like doing a crossword puzzle or jigsaw puzzle because you’re working within a limited space and every part has to be the right part. I think novels, even though it shouldn’t be this way, are more forgiving in a way. But since I’ve written some stories that have done well and one novel, that is really bad, it’s easier. AS: What are the challenges in writing short stories? RB: The biggest challenge in short stories is compression and re-learning that. In novels, a lot of it is about expanding things and following possibilities. At least it is for me. In short stories you really are asking yourself, “Do I need this?” or “Do I want this?” or “Should I use this space for something else?” or “Is this really relevant to the story?” In novels, you can have these long digressions. My stories are long. I pretty much have forgotten how to write a story under 8,000 words. AS: How does your teaching affect your writing and writing affect your teaching? RB: My teaching makes my writing much better. I find teaching incredibly stimulating and exciting. Every time I read someone else’s story in whatever shape it’s in, I always figure out things about my own work also. I always learn. I think that for a lot of us that are probably not going to be in the student role anymore, teaching is just as good for that. I hope my students get a lot out of it. I know I do. And I do think being a practitioner helps in the teaching. The assignments I give my students really grow out of my own struggles which are ongoing. One weird thing about writing is you learn how to do it and you never learn how to do it. AS: What do you teach? RB: I’ve taught general creative writing classes, undergraduate and graduate level, and I’ve taught short stories. I do individual coaching and have done some weekend workshops where the points I’m teaching are very applicable to short stories or novels. I try to make it that whoever’s taking it gets something out of it. I also teach non-fiction. I write memoir essays. So I teach that as well. AS: How do you decide whether to tell a story in first-person or third-person? RB: That is one of the things I work hardest on and every story I go back and forth and more and more I end up in third-person. It’s always a question for me of how to tell the story best and what would be gained by having it in first-person because you lose a lot. You lose some distance. You lose some perspective. Most of the time, I feel that the central character is not the best person to tell the story. Usually they don’t have enough insight to do it. I don’t want them to be that smart, I don’t want to be that wise and I’m not trying to create an unreliable narrator. So I want a narrator who has a bit of wisdom about the situation. AS: Where do you get most of your ideas? RB: They’re not autobiographical. I’m not someone who goes through life and has things happen and thinks, “That would make a great story.” I actually really admire people who are able to do that because I’m not. Every story in there has some sort of spark of something that did happen to me. There’s a story about a neighbor and a fence [“If I Loved You, I Would Tell You This”] and there actually is a fence in my driveway. There’s a story about someone having electricity in the water and we actually did have our water electrified. AS: Why did you want to tell that story about the woman and the father connection [“Gaining Ground”]? RB: That’s one that I have no idea how exactly it came together although there are some autobiographical aspects in there. We did have electric water. My father did not kill himself. He died six months before that. I’m sure I was working through all kinds of stuff but for me the way that happens in stories is the way that happens in dreams. I can go back over them and see my obsession or my psyche but it’s all really changes and it’s really similar to dreams for me. AS: The story, “If I Loved You, I Would Tell You This,” about a woman with cancer who has an inconsiderate, selfish neighbor who builds a fence that abuts in front of her house is told in an interesting style. How did you develop it? RB:That one came about out of a real emotional impulse. Our neighbor built a fence that basically as in the story is in front of our front door. I couldn’t get over the fact that he could be that mean. I had this impulse to talk to him about it and then I realized that I didn’t care about him enough and I didn’t think he could learn anything. He was past caring. That was really wanting to talk to someone and that is why it is one person talking to another character. Emotionally there’s a lot of truth in that story. AS: Can you talk about the woman with the prosthetic leg and the woman who was jealous of her [“Pine”]? RB: That’s sort of a soccer mom story and I had one season of being a soccer mom. There was another mother there who kept inviting me to join support groups with her. It was clear to me that this was a woman who felt like there was something missing in her life. Again in that weird dream way, the way that came out in the character is that she’s literally missing a limb. But the way it started was someone who was in some way incomplete. Also, the people you meet through your children who are not necessarily a person you have anything in common with or would choose to spend time with but that’s part of the child-rearing years. AS: What attracts you to writing about the darker side of people? RB: I’ve always been drawn to how people cope to tragic situations. I grew up in a family whose grandmother was paraplegic. Around the time I went back to writing, I also had some losses in my own life. I think the stories for me were, in a way, trying to work it out and look at situations where people were grieving and write them into a more optimistic position. AS: How do you decide which stories to put into a collection and what do you think makes a great short story collection? RB: The reality of my stories is that they were not written to be read together. They were written over eight years and they were published separately. When I was writing them, I was not writing for a collection. I was writing each one to write the best story I could write. When I submitted a collection, I submitted the best stories I had. I wrote one more after I’d already submitted it. I have mixed feelings that they are in a collection. A lot of times I wish I could put a label on them that says, “Read one a week.” I didn’t write them to be read like a novel. I think in a way it does the stories a disservice to read them that way. I like that they are all together but I think that my collection would really benefit from people reading them [slowly] and [spaced out]. AS: What inspires you to write? RB: I like to observe and share it. I want the words to be good because that’s the way to communicate. It’s that I saw something about the way people react and I think it’s cool and I want to describe it. Robin Black is a graduate of the Warren Wilson MFA Program for Writers. Her essays and stories have been published in The Southern Review, The Georgia Review, Alaska Quarterly Review, Bellevue Literary Review, and other publications. She lives in Philadelphia. This entry was posted on May 18, 2010, 01:50 and is filed under Books. You can follow any responses to this entry through RSS 2.0. Both comments and pings are currently closed.